Mumbai(PTI): Filmmaker Karan Johar says whenever he is launching a star kid, his thought is to make then go beyond their name and make their own identity. 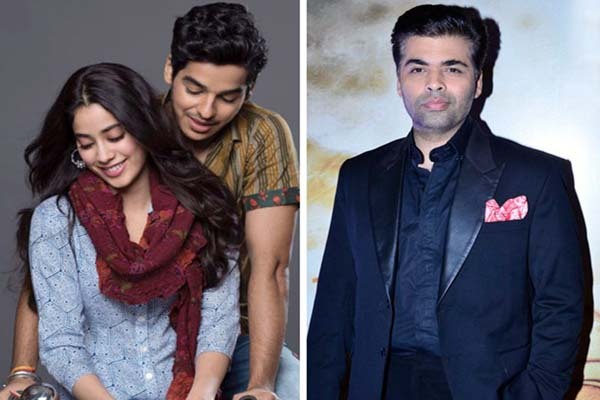 Karan is launching Sridevi’s daughter Janhvi and actor Shahid Kapoor’s half-brother, Ishaan, with “Dhadak”, an adaptation of Marathi blockbuster “Sairat”. Hinting at the nepotism debate that started with actor Kangana Ranaut calling him “the flag-bearer of nepotism”, Johar said, “Nowadays, there is so much debate about name, but people forget that even behind a name there is passion and hard work. It’s not easy to face the camera, to come in front of the media. They are kids. And we put a label to them. “Dhadak” is directed by Shashank Khaitan, who previously helmed “Humpty Sharma Ki Dulhania” and “Badrinath Ki Dulhania”. “It was a story wanting to be told all across the country. It is so relatable. I want to make the story my own and to pay the best homage to ‘Sairat’. I’m really proud of ‘Dhadak’ and these two kids,” the director said. The film’s music has been composed by Ajay-Atul who were also behind the original soundtrack of “Sairat”. Two songs from the original film “Zingaat” and “Yaad Lagla”, have been retained in the adaptation while two new tracks have been added. “To write it in Hindi and retain the interest for both the songs required a lot of hard work from my side because both the songs are national phenomenon,” lyricist Amitabh Bhattacharya said. “Dhadak”, co-produced by Zee, is scheduled to release on July 20.